One of our favorite albums of 2017, Kacy & Clayton’s The Siren’s Song found the pair widening their scope, building on an existing foundation of the music and traditions of Southern Appalachia, the British Isles, and their rural ranch Saskatchewan home. Here, fittingly, they pay tribute to fellow Canadian exports Gordon Lightfoot and Ian & Sylvia. Kacy & Clayton, in their own words, below. 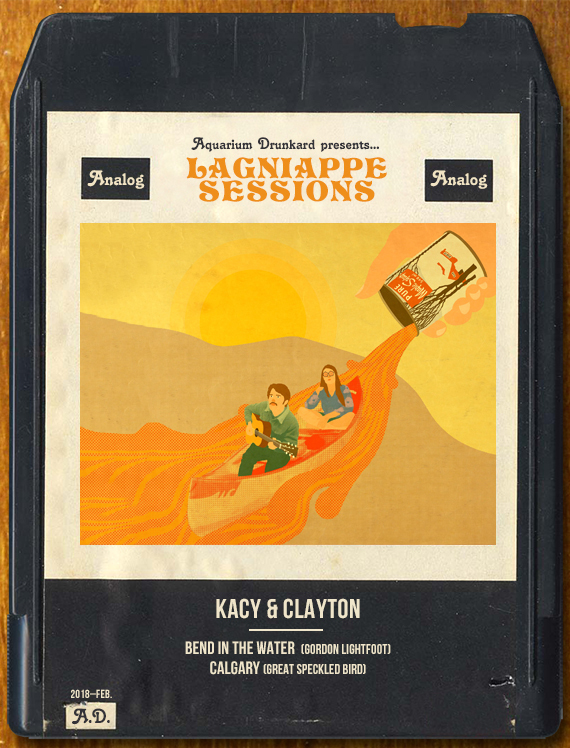 For our Lagniappe Session, we chose to record a couple songs from two Canadian artists that have had a profound influence on our own music. The first being Gordon Lightfoot’s Bend In The Water, and the second being Ian & Sylvia and the Great Speckled Bird’s Calgary. We consider Bend In The Water to be one of Lightfoot’s most good-timing compositions and an important installment in the Canadian Canoe-Rock sub-genre. Calgary is filled with perfect imagery of ice flows on the Bow River, a card game on the Gulf of Mexico, and one friend’s desperate plea to borrow money from another. These Canadians have the respect and admiration of many; from Bob Dylan and Neil Young on down to my Mom and Dad. During a jam session at my Great-Uncle’s wake, my Dad tried to get Gordon Lightfoot’s phone number from the operator to call him and ask him what the lyrics to “The Wreck of the Edmund Fitzgerald” were. Ian Tyson once played a fundraiser in our community hall for ranchers hit by the 2004 B.S.E. crisis. Though it’s hard to draw a connection between these two incidents, I suppose my point is that these artists have given Canadians a music they can relate their own lives and experiences to.